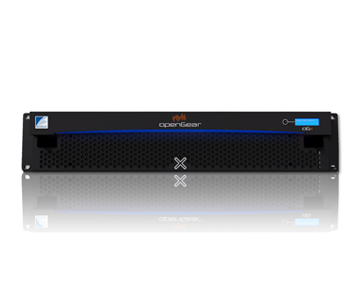 The Emmy-winning openGear® platform adapted to UHD and IP infrastructures. Superior flexibility, power, and control are unleashed in the 4th generation of the openGear® platform, oGx. Built for today’s baseband, hybrid and IP facilities it is the broadcast world’s first and only open-hardware platform, and your platform of choice for your broadcast infrastructure needs. More power & cooling for the most demanding UHD, 12G SDI & IP workloads. New frame glow looks fabulous but is functional too! Colour code your rack room by function, air chain, or whatever works for you! Robust 600-watt redundant power supply with integral cooling. Front LCD display for a name, IP address, and fault identification. Supports any mix of analog, digital, video, audio, SDI and IP modules in the same frame. Removable front door for easy fan servicing. Standard DashBoard control system for setup, control, and monitoring.